5 years ago today I married my best friend. So glad you picked me Ross... I love you. *My mom brought over a bag of every letter, every invite, basically every piece of paper that I had ever given my grandmother. In that bag was all the invites/ thank you notes sent to my grandma for our wedding. 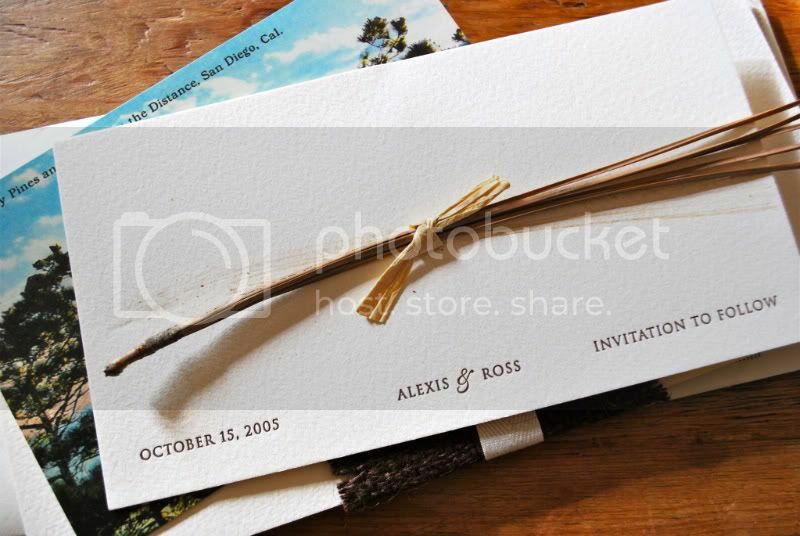 I remember Ross and I sitting at our dining room table tying pine needles to every save the date. And our invite was wrapped in burlap that Ross and I put on together. So special. It is exactly how we sent it 5 years ago... just waiting for me to discover from my grandma in heaven. Your invites...? You make the most simple things that most people would ignore (I am most people) into the most beautiful and organic creations. It's one of the things I admire most about you. Ross is a lucky man. happy anniversary! i love how your grandma kept every letter - those little treasures are the best ones. happy anniversary! beautiful invites and a beautiful story. thanks for sharing! I love you, Alexis. Thank you for this post. PS: I just read that October 15, 1960, was the first day Ringo, Paul, John and George played together. They played Gershwin's Summertime. Powerful day! Happy anniversary lady! What a sweet story and beautiful invites. I hope you have a fantastic weekend! how cute is it that Ross commented?? ya'll are a fabulous pair..congrats! "Ross the Boss!" Love it, too cute. Congratulations to a beautiful couple with a beautiful little family:) To many, many, many more "powerful" years! Happy anniversary!! You guys are so adorable. This is beautiful! Congratulations to you both! Congratulations Alexis! You and Ross make a beautiful couple, and have a beautiful family! Wow, you've really been through a lot this year! I'm sorry to hear about your friend, beautiful post and Happy Anniversary!